Unit 117 at Joanne-Apartments is a two bedroom, fully self-contained, third floor unit with all amenities that you need for a fantastic short or long stay. Previously only used by friends and family this unit is now being made available for others to enjoy. Perfectly positioned opposite Happy Valley park and playground, it is just a very short walk to Bulcock Beach and Pumicestone Passage, Kings beach, Sunday markets, shops, cafes, restaurants and movies. Park the car in the garage and leave it until time to go home! Being on the top floor with no lift, there is a wonderful opportunity for incidental exercise. Stylish, comfy, clean. Recently renovated with two pac kitchen, stone bench, leather lounge, one queen bed + 2 singles, a fully tiled bathroom with bath and shower, air conditioning, roomy balcony with outdoor setting for four, ++ other features. 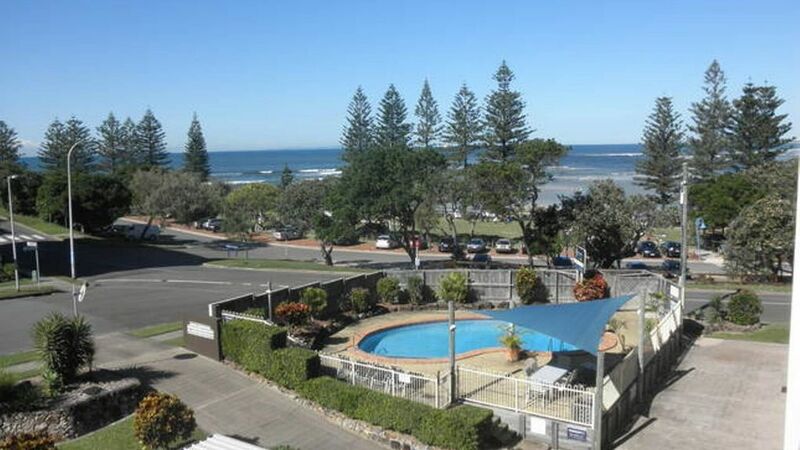 This is a wonderful spot to relax and admire the sea views from your balcony or to get out and about to do all the exciting activities Caloundra and the Sunshine Coast have to offer. Unit 117 at Joanne Apartments is in a fantastic location and is well appointed. It's ideal for a family of two parents and two kids. The only issue we had was the lack of wifi which for us was a big issue as we don't live in the country so don't have regular local data plans on our phones. We were unable to connect with family on Christmas day and keep up with important business matters. Our family stayed here for 2 nights, it was a great unit in a great location, we will stay here again. Such a well equipped modern unit with a wonderful comfortable feel throughout and exceptionally clean. Generous sized, secure garage and nice water views from balcony and relaxing little private pool. We will surely visit again!